The American space agency's New Horizons mission has struck gold again. After its astonishing flyby of Pluto in 2015, scientists have just discovered that the probe's next target is not one object but very likely two. It seems New Horizons will now be making a two-for-the price-of-one flyby when it has its encounter on New Year’s Eve and New Year’s Day, 2019. The plan is for the spacecraft to pass the 30-40km-wide main object with a separation of just 3,500km, acquiring high-resolution pictures and other data. This should reveal new information on the Kuiper Belt - the band of distant, frozen material that orbits far from the Sun. On flyby day, New Horizons and MU69 will be some 6.5 billion km (4.5 billion miles) from Earth. 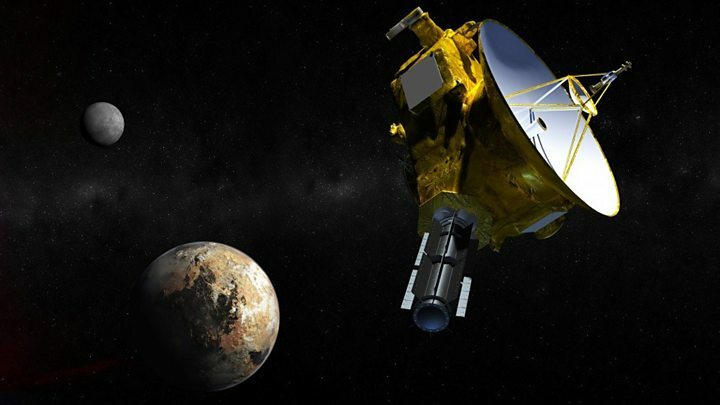 "Besides being the farthest exploration in the history of humankind, this flyby is also going to the most primitive and pristine object ever explored," said Prof Alan Stern, the principal investigator on New Horizons. "We've really never been to anything like this. Of course, we've had lots of missions to comets that come from the Kuiper Belt, but they've come down into the inner Solar System where they're processed, sometimes through hundreds of passages by the Sun, and they're much smaller. "If you remember Rosetta's comet, 67P, which you saw so many pictures of from that great Esa/Nasa mission - this is a much larger target. It could fit about a thousand Rosetta comets inside itself." Prof Stern was giving an update on preparations for the MU69 encounter here at the Fall Meeting of the American Geophysical Union. His team described efforts earlier this year to tie down details about the target object's precise movement and size using occultation. This involves making observations of MU69 as it passes in front of a far-off star. The tell-tale details are in the way the star blinks. What emerged from the studies was fascinating. Not only does it seem there is an accompanying moonlet perhaps 200-300km from MU69, but the main target itself may also actually be a double act - either two individual units with a small gap between them; or just touching, something called a contact binary. "This is very exciting. 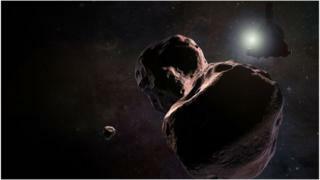 This is going to have a lot of surprises," said New Horizons science team-member Dr Marc Buie, of the Southwest Research Institute, Boulder, Colorado. "We think this is probably a sign that the object itself was not a collision fragment; we think it was made this way. And so we really are going to see something that dates back to the birth of our Solar System." The flyby campaign begins in earnest in August, when the first course corrections that may be required for New Horizons will be made. Observations will also take place to ensure there are no hazards in the vicinity of MU69 that might necessitate a wider pass. The serious business of the flyby occurs over a nine-day period starting on 25 December, 2018. New Horizons will focus on the Kuiper Belt object, hoping to return images that have a best resolution of about 30m per pixel. The first of these should come back to Earth a couple of days after closest approach, which currently is timed to occur at 05:33 GMT on 1 January, 2019. "Using New Horizons' suite of seven instruments, we'll be characterising the geology and morphology of the surface, looking to see whether there are any craters. We certainly expect to see craters," explained team member Dr Anne Verbiscer from the University of Virginia. "Possibly there could be grooves. We'll also map the surface composition, searching for possible ices as we saw on Pluto.